I had shared this post a year ago as a guest post on Bacon Time with the Hungry, Hungry Hypo. Since it has been a year, and most of my readers might not have seen them, I thought I would share them again here. Meet two more members of the Pumpkin Gang, Bat Pumpkin and Spider Pumpkin. I started both pumpkins by painting dollar store craft pumpkins black. I chose the largest size google eyes that I had in my stash of eyes. The legs are made from a giant chenille pipe cleaner that I found at Michaels. 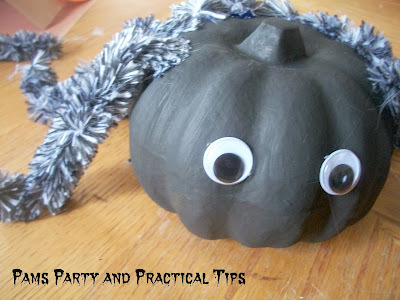 I cut the pipe cleaner into eight equal parts, and glued them onto the pumpkin with a glue gun. 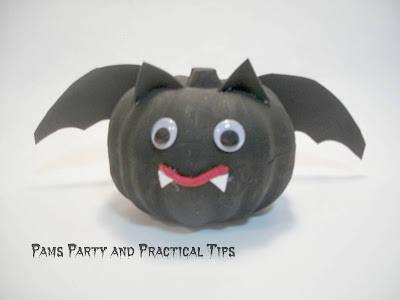 I made the face of the bat the same way, but I adding small triangles of craft foam for the fangs. The wings and ears of the bat are also made from craft foam. 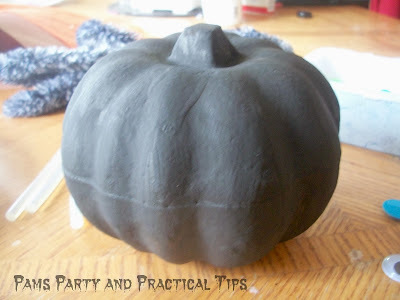 Once I got a shaped that I liked, I glued them onto the pumpkin. Pretty easy right?! They are also cute, and not scary like their real life counterparts. 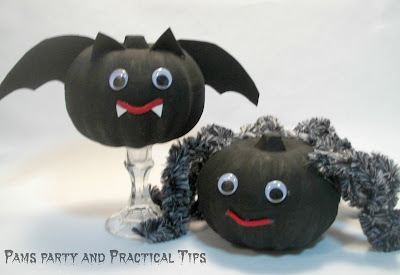 The Bat and Spider Pumpkins will be on display with their Pumpkin Gang friends.. There is even a few more in the works for this month! Stay tuned to see what they are. I will be linking my pumpkins up on these fabulous linky parties here. These are sooooooooooooooooo CUTE !! I love that little bat, he's so cute! 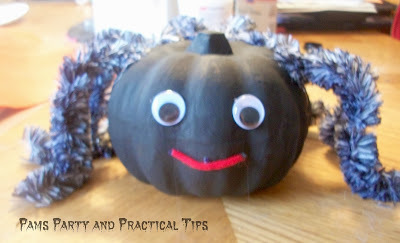 I'm thinking this idea would be cute with those tiny pumpkins you can get too. Definitely.. I have been meaning to get some of those, but have not made it over the flower store where I usually buy them yet. Really amazing for Halloween ! Those are adorable! What a fun craft for Halloween! Love these...thanks for linking up at The Patriotic Pam this week. I am featuring them this weekend on our Link Party. Come by and check it out. It goes live at 7pm tonight. And I will be sharing on my social media this weekend. Hello, I am coming over from The Patriotic Pam's Blog Hop. I am one of your newest followers on twitter, google+ , facebook and pinterest. I would love if you could visit me . Thank you so much for following and it's great to meet you.